We all know some of the famous iconic routes dotted all over the world which attract people who have a travel bucket list. These range from the Orient Express to walking the Camino in Europe. Further afield there is the Great Wall of China and Routes 1 and Route 66 in the USA. I thought it was about time that I started ticking off some of this list; hence a well planned visit to the USA. The first thing to do was hire a Mustang – an essential component for the trip as no way could this be done via public transport; after all it couldn’t be just any old car either. The route my husband and I took started in San Francisco; then on to Solvang (a replica of a Danish village); from there we travelled the Big Sur and down to Los Angeles. The next stop was Las Vegas before we headed off on Route 66 towards Gallup in New Mexico. We had chosen Gallup for a variety of reasons; one of them being that my husband knew a colleague living near there. We were interested in visiting some Native American territory. This way we would be able to immerse ourselves in the local community by getting to meet some residents rather than just scratching the surface. 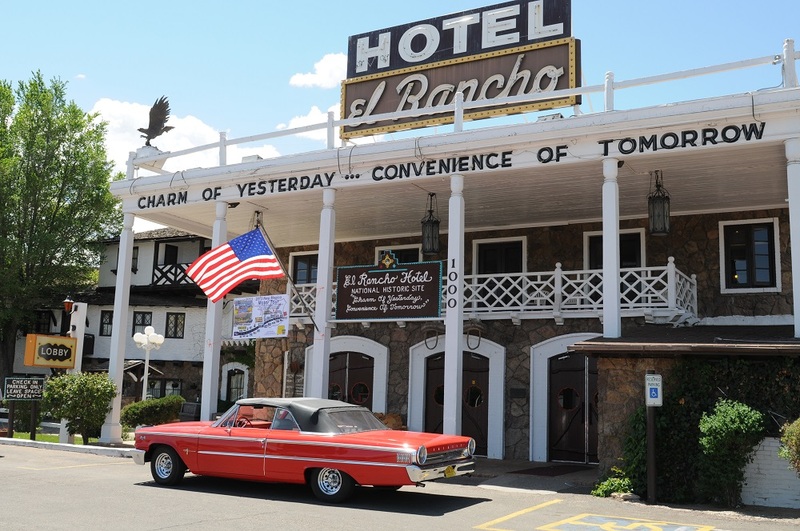 We chose the El Rancho Hotel in Gallup as the base for our stay there. After all if it was good enough for movie stars like John Wayne, Spencer Tracey and Katherine Hepburn then it was good enough for us. The El Rancho hotel was originally owned by the brother of D.W. Griffith (R.E. Griffith) who directed many famous movies in the western genre. It was opened in 1937, literally as a base for the movie industry and is located on the old Route 66 on The Trail of the Ancient Byways. The building is listed in the National Registrar of Historic Places. On arrival we were delighted with the by-line on the hotel fascia board which read ‘Charm of Yesterday – Convenience of Tomorrow’. 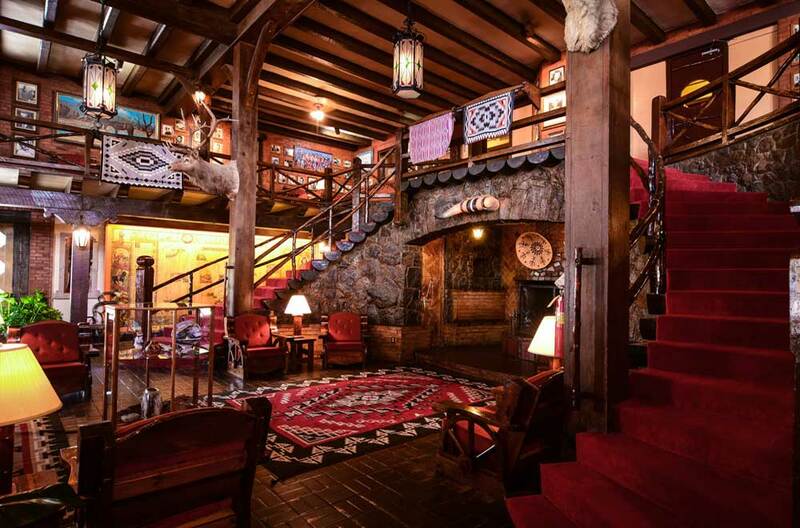 We were wide eyed when we saw the front lobby of the El Rancho Hotel (or Inn). 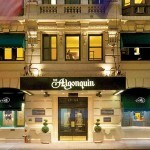 It was the antithesis of the Bellagio Hotel in Las Vegas where we stayed the night before. Despite the glitz and glamour of The Bellagio with its wall to wall marble luxury it lacked any soul or character and I couldn’t wait to leave there. 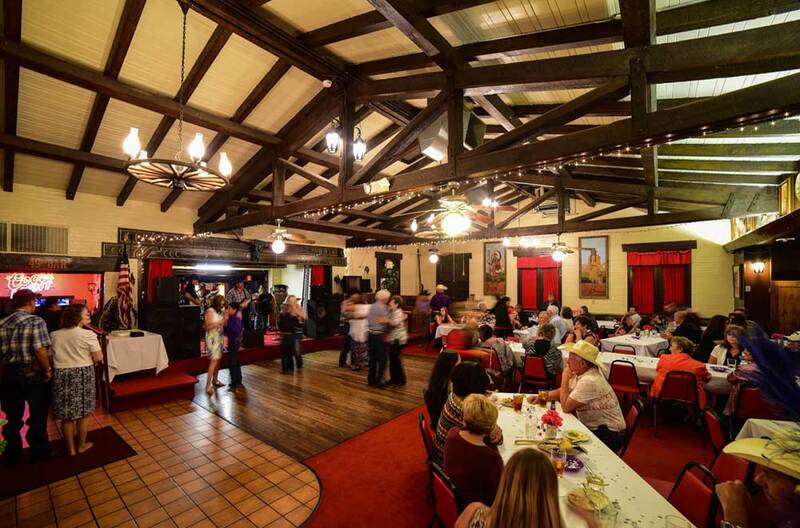 The El Rancho Hotel had an old fashioned colonial style square wooden hall with stairs on either side leading up to the first floor. There are only three floors in this hotel. The wooden pillars on either side of the hall were adorned with Moose and Stag heads with Native American rugs and other memorabilia scattered around in a random fashion. The Reception desk was definitely of a bygone era to such an extent that I was crossing my fingers that they would accept credit card payment. 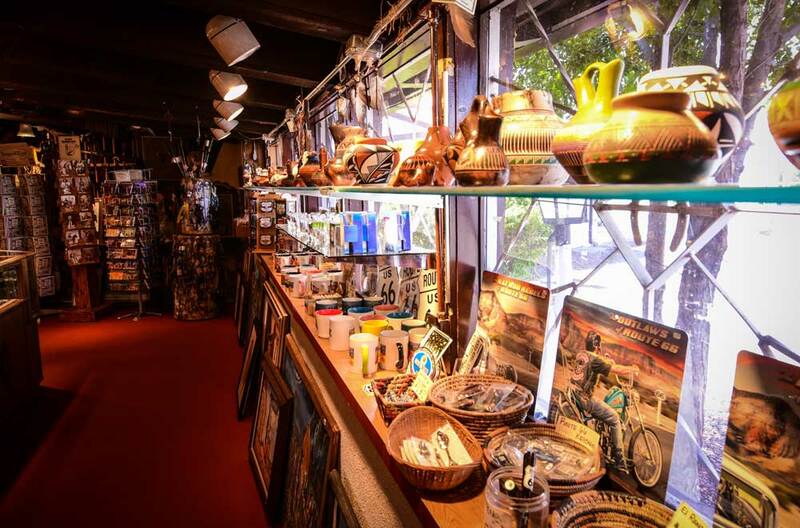 There was a spacious shop adjacent to the Reception with very high quality souvenirs and native art. The art came mainly from three tribes – the Navajo; the Hopi and the Zuni. There were also lots of booklets, maps etc. so this was really handy to have and ensured that we had done our homework before we ventured forth the next day. There are 75 bedrooms in the hotel, which is tiny by American standards. The rooms are also on the small side – very European! Each of the bedrooms was allocated names of various movie stars who have stayed there. So many stars have visited the El Rancho that some rooms had several names allocated to them. We stayed in the John Wayne room. The bedroom was basic, including the bed, mattress, bed linen and carpets. There are half wagon wheels as head boards in all the rooms. All the rooms have the same deep red tweedy type curtains with dark wood furniture so they are somewhat sombre and a bit on the gloomy side. The bathroom – well let’s just say that it was just about adequate. The rooms don’t really have the convenience of today so I now understood why the sign outside said ‘tomorrow’! However, there was air conditioning (essential). WIFI was intermittent so techie visitors beware. The 49er Lounge and Bar was fantastic – a touch of a John B. Keane novel and I could have spent the whole evening there very easily having chats with locals as they came and went. The Dining Room was again fairly basic and I opted for a John Wayne burger just to keep up with the western theme. As expected it was very well cooked and flavoursome. Because I was a little dehydrated after a long and hot drive I just had water with the meal. However, retiring to the Bar after dinner I asked for a glass of wine to be informed that it was a Sunday and I couldn’t have alcohol except if I was eating. Despite explaining that I had already eaten, was resident in the hotel there was no moving them. There are strict laws about alcohol and the laws are there for a very good reason. You need to check out when you can consume alcohol in the bar when you arrive. On the plus side I was bright eyed and bushy tailed next day for a serious drive around the reservation. Our friend took time off to drive us both around the majestic Navajo territory and we traveled on several off the beaten tracks, which made it even more interesting. Our drive lasted the whole day from 9am to 7pm and we had only covered a small area of the reservation. The Navajo territory covers over 27,000 square miles! One town that was standout as special was Window Rock where the Navajo Parliament building is located. 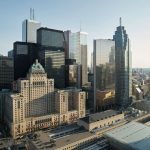 There was a tangible aura of of native culture and history emanating from this building,which was shaped in a oversize ‘Hogan’. A Hogan is the name for the traditional family room of the local dwellings. We were also informed that nobody actually owns their houses on the reservation; they belong to the Navajo Nation and are rented to Native Americans only. Planning for a new dwelling is usually done by a family member so there were clusters of ‘Hogans’ all occupied by extended families dotted around the territory. There is no other apparent industry other than tourism in the region. It was therefore heartening to hear that there are opportunities for the younger generation to attend the nearby Diné Commuity College, where courses in other subjects are available to students. The El Rancho Hotel is way off being a luxury hotel – and to be fair they don’t try to sell themselves as luxury – it is authentic to such an extent that it really is in a time warp. If you are the precious type you might hate it. If you are a person who is open to new experiences and take things at their face value then you will enjoy it. Whilst we did more than just scratch the surface and learned a lot from our short stay it has to be said that Route 66 isn’t yet completed. Yes, the bucket list has been started but the problem is that it is generating a compelling need to re-visit. If this continues with other trips then we will never get to properly finish any of them. http://www.route66hotels.org El Rancho Hotel, 1000 E.66, Gallup, NM 87301, USA.